This item is of course short on details, but addresses the serious need for high speed connectors between population centers. Can an air based system do the trick? I do not think so. The air flow has to surpass the speed of sound in order to achieve speeds in excess of the speed of sound and the internal drag pretty well ends that in a tube system. What I would try though is to put the weight of the entire train on an air pad which needs on board compression. I would also use that on board compression to apply the Coanda effect to lift the bow wave up and over the bow. We would still have a lot of drag on the train itself but otherwise it is still an open air proposition. Curiously, we should be able to tap bow pressure to take over the compression task and possibly use the escaping air to limit drag along the lower edges. Such a train may possibly match the speed of an airliner although I suspect we would need to get serious about banking the road bed itself. A better solution may well be an evacuated tube because that we know is a one time expense. Then the only limit on speed will be the g's on the curves. I would also place the tube above ground as much as possible and this will need a rethink on our material options. For the present, current high speed technocracy is satisfactory to our needs and can be bought off the shelf. The problem in North America has been historic ownership. This has to be addressed in an innovative way. Musk also cites Aeromovel as a similar transportation network, meaning that the Hyperloop could take advantage of a similar pneumatic transportation guideway. This system I have in mind, how would you like something that can never crash, is immune to weather, it goes 3 or 4 times faster than the bullet train… it goes an average speed of twice what an aircraft would do. You would go from downtown LA to downtown San Francisco in under 30 minutes. It would cost you much less than an air ticket than any other mode of transport. I think we could actually make it self-powering if you put solar panels on it, you generate more power than you would consume in the system. There's a way to store the power so it would run 24/7 without using batteries. Yes, this is possible, absolutely. LA Times talks to Elon Musk in an interview. California high speed rail is starting up, but you've proposed an alternative — maybe solar-powered, maybe on a pneumatic track — you call the hyperloop? I've got to find the time to write up the details. I'm going to put it on a blog and open-source the idea. Why are we, in the center of high tech, doing such a bad job [with high-speed rail]? It's embarrassing. It says all sorts of wrong things about our state. I was thinking about what could be better, state of the art? That's where I came up with the idea for a fifth mode of Earth transport, apart from planes, trains, automobiles and boats. The hyperloop could go from city center to city center in not much more than a half-hour. Aeromovel blowers propel air (under low pressure) through a duct built into the guideway. The pressurized air pushes a propulsion plate attached to the bottom of the vehicle. This propulsion plate acts like an upside down sail, propelling the vehicle forward and helping to stop it when the air flow is reversed. Air propulsion eliminates the problems of heavy rail traction; wear on wheels and tracks is reduced to a minimum. Acceleration and deceleration are smooth and efficient; traction noise and vibration are minimized; vehicle speed can reach 80 km per hour (50 mph) in urban applications. The combination of pneumatic propulsion and non-axle wheel design permits AEROMOVEL® vehicles to climb steep gradients up to 12% and traverse sharp curves with a radius as low as 25 meters (82 Feet). The vehicle is driven by a pneumatic propulsion system which converts electrical power into air flow and transmits thrust directly to the vehicle without gears or intervening electric circuits. Stationary electrical blowers, located close to the passenger stations produce the necessary pressurized air, which is generated according to the desired vehicle acceleration rate and speed. Excellent system reliability is achieved by using these sturdy, proven industrial components. The power propulsion units are completely contained in sound-insulated housing units. The variable speed motors increase efficiency and minimize any loss of energy. Large, powerful motors provide AEROMOVEL® with a wide range of air movement capability, while keeping the cost of operation and maintenance at a minimum. The stationary power propulsion units reduce wear and allow simple and efficient maintenance, because they are separated from the moving vehicle. 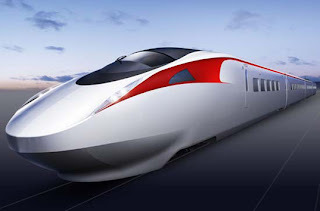 Nowadays, our transportation way has become very fast with high-speed trains and air transportation. 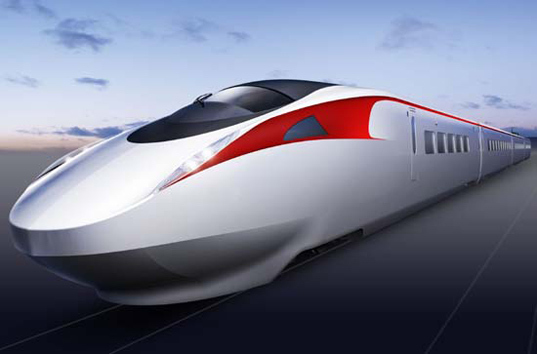 High speed transportation has many advantages available like environmental, economical, and much transportation. According to me, we should at least one time read this article to understand the importation of the high speed transportation. Nowadays, we all know anyone has not an enough time to wait and spend their time in a transportation system. So it's a nice thing to talk something about the high speed transport system. Mobility of labor and capital increases with the development of transport. An efficient network of transport services encourages the movement of people from one place to another place.